The club’s suicide awareness programme is managed by an assigned Lion with a small committee in support. The club members like everybody else, are appalled at the number of suicides occuring in our communities, particularly amongst the young. We feel it incumbent as an organisation whose motto is “We Serve” to do something about the suffering felt by the victims and their families and friends. Lions Clubs launched a major national Bullying Information Campaign at Leinster House on Wednesday 18th February 2015. 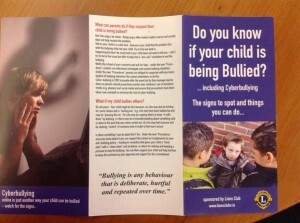 Specially commissioned information leaflets on bullying and cyber-bulling are being distributed to all houses with school-going children of vulnerable age by Lions Clubs throughout the country. Lions work with School Managers and Principals to effectively distribute the leaflets, 42,000 of which have already been distributed by 28 Lions Clubs during the pilot stage of the project. ‘School Principals have been very positive about the initiative and have given the project their full support’, says Pat Connolly, Lions District Suicide Prevention and Anti-Bullying Officer. 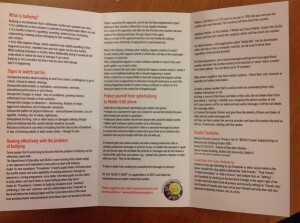 ‘The leaflet contains vital information for parents including advice on identifying bullying problems, dealing effectively with a bullying issue and information on public policy in relation to bullying. A special section deals with the critical issue of cyber-bullying’. He also acknowledged the input of retired teacher Sean Fallon of the Anti-Bullying Campaign and a psychologist in the compilation of the text. Lions District Governor Pat O’Brien has also welcomed the campaign. ‘Bullying, and particularly cyber-bullying has become a major issue in our society and many parents are unaware of how to recognise bullying and how to respond. This Lions campaign is designed to provide all parents with the information they need’, he said. This is a YouTube video on Cyber Bullying. To all who see this video. A Suggestion. Can you think of anyone in your circle of friends, family, and teachers who would benefit by viewing this video. If so pass it on. Or pick 10 people from your address book.